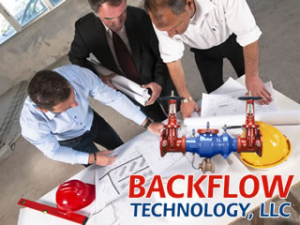 Backflow Technology, LLC holds a Virginia Class A Plumbers Contractors License specializing in backflow prevention and cross connection control. Established in 1997 as a backflow prevention assembly testing, repair and installation company by Philip S. Barbe, Jr., who remains the company’s senior cross-connection authority and serves as the President of Backflow Technology, LLC. We are the oldest single owner backflow prevention and cross connection control company in the area. We are a full-service company based in Ashburn, Virginia, specializing in testing, repairing, installation, and consulting of backflow prevention assemblies for commercial, residential, industrial, medical, government and state facilities. Our company employs full-time certified backflow prevention specialists with significant field testing and repair experience. We have the knowledge and ability to test, repair and install all sizes and models of backflow assemblies and are current in all regulations and specifications when they are modified or changed. We have over 40 years of combined experience solely in backflow prevention and cross connection control. Our office staff is knowledgeable and readily available to answer your calls during business hours. Ensuring your drinking water is free from contamination is a responsibility that the experts at Backflow Technology, LLC take very seriously. Protect yourself, your friends, and your family. There are many companies that offer backflow prevention assembly inspection services and choosing the right one can be a daunting task. Important things to look for when selecting a company is to ensure they are fully insured, licensed to not only inspect, but also licensed to perform the required repair of backflow prevention assemblies in the event the assembly fails inspection. If a problem is found during the yearly inspection, the equipment must be repaired or replaced pursuant to the timeframe allotted by the local water authority. Trusting your health, the health of others, more importantly your life or your loved ones should be in the hands of experts such as Backflow Technology, LLC. You can depend on us 24 hours a day 7 days a week…we are a phone call away and will arrive within an hour. We are fully insured with VALID General Liability and Workers Compensation Insurance. Our professional specialists are the best trained in the industry providing dependable service and arrive in uniform driving a Backflow Technology, LLC identifiable vehicle. We prepare and submit all the required paperwork timely to the local water authority to ensure you are in compliance at no extra cost. FORGET THE REST…CALL THE BEST!! !